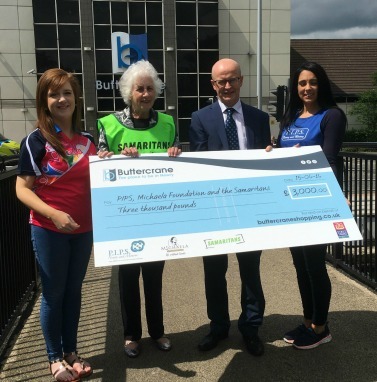 Today Buttercrane’s nominated charities celebrated having raised some £3,000 through recent in centre activities. PIPS, Samaritans and Michaela Foundation were selected as the centre’s nominated charities at the start of the year following an application process. The funds were generated through a range of activities hosted in or by the centre over the last 6 months and included Awareness Days; a Doll Collection Sale; a Lego Firewalk Challenge; Change for Charity initiative; Share the Love Valentine’s promotion and an ongoing auction of signed NI and ROI Euro Football jerseys.